An 18th century engraving, depicting the explosion of one of Giambelli’s “hellburners” on the Duke of Parma’s pontoon bridge at the Siege of Antwerp in 1585. The Catholic–Protestant schism let loose antagonisms that shook kingdoms on the Continent as well. For several decades, Italy had been the area of Europe in which the air was almost perpetually tinged with gunpowder smoke. In the second half of the sixteenth century the violence moved north, to France and the Dutch Republic. It would soon spread to Germany, the wars there growing increasingly fierce. The core issues—nuances about the best way to achieve everlasting life through Jesus Christ—hardly seemed to justify mass slaughter, yet they led to an unimagined brutality. 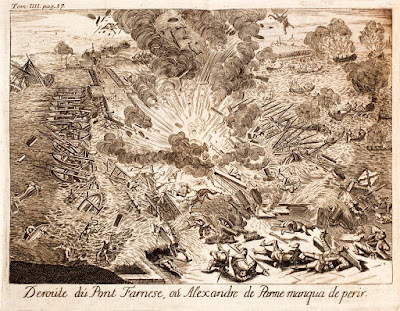 Gunpowder added a horrific dimension to the wars of this period. Both handheld firearms and artillery were achieving a new efficiency, inflicting battlefields with storms of deadly missiles. “Firepower” became the military watchword of the day. Fueled by the lethal capabilities of gunpowder, violence raged across northern and central Europe until the middle of the seventeenth century, killing both soldiers and inhabitants by the tens of thousands. Maurice of Nassau was 17 years old when he took power in Holland in 1584, assuming the title stadtholder. His father, William the Silent, had just been assassinated by agents of Philip II, the Hapsburg monarch of Spain. With the Dutch Republics struggling to win independence from Philip’s empire, Maurice took a keen interest in military affairs. Commanders across the continent were searching for ways to make gunpowder the centerpiece of battle, not just an adjunct to it. Maurice and his cousins set up arrays of toy soldiers to explore new ways of using gunpowder weaponry. With the same fresh insight that had touched Joan of Arc during the 1420s, Maurice started a process of military realignment that would bring powder-based warfare to a new level of sophistication. The toy soldiers were a telling emblem—the fighting man was on his way to becoming a cog in the terrible engine of firepower. Individual firearms had been around for a century, but no one had found a way to make them truly effective on the battlefield. Maurice saw that musket-wielding soldiers, extended in a line, could unleash a wall of fire to fend off and disrupt enemy forces. What he needed was a system to coordinate that fire. A student of the classics, he found the answer in the military thought of the Romans, the last power to rule Europe with an infantry-based army. His goal was concentration and coordination of firepower. The secret for achieving it was drill, a means of making every soldier move in lockstep with his fellows. The formation that Maurice devised was a line of infantrymen ten deep. Those in the front row fired, then turned and countermarched to the rear, where they could reload in relative safety. Those in the next row stepped forward and fired in turn. A murderous ballet ensued, groups of men moving in unison and in close coordination with other units. Maurice broke down the process of loading a firearm into forty-two small gestures, each with a name. His troops practiced the movements over and over until they could be performed without thinking under the stress of battle. Combined with a system of rigid discipline, drill melded the mass of warriors into a single unit. “No one reasons, everyone executes,” is how the Prussian monarch Frederick the Great would describe it in the eighteenth century. Drill not only turned individual soldiers into an effective means of delivering violence with gunpowder, it also trained them to stand up to the harrowing return fire of the enemy. It gave soldiers the ability to perform a complicated choreography in the mouth of hell. The goal was efficient repetition and massed fire, not heroics. Discipline replaced initiative in war, a transformation that would be paralleled by the coming encroachment of factory production on the methods of the traditional craftsman. A year after Maurice rose to the head of Holland, gunpowder trumpeted its role in the coming cataclysm in yet another way. Spanish Hapsburg troops under the Duke of Parma were besieging the Dutch port of Antwerp. An itinerant Italian military engineer named Federigo Giambelli had offered his services to the Spanish and been rebuffed. Like the enterprising engineer Urban at Constantinople, Giambelli gained revenge by peddling his skills to the Dutch. Giambelli turned a sailing vessel, ironically named the Hope, into a new weapon: the first floating time bomb. He packed its hull with almost four tons of gunpowder and surrounded the explosive with bricks, scraps of metal, even tombstones. This debris would turn into deadly missiles when the powder went off. A clockwork device controlled the fuse. The ship was known as an “infernal machine,” a term that straddled two worldviews: the medieval, now fading, of demonic influences; and the modern, of a mechanical, clockwork universe. The Dutch set the Hope adrift on the tide. The vessel approached a densely manned pontoon bridge by which the Spanish were blocking access to the city. The bomb exploded on schedule, blowing a gap in the bridge and strewing wreckage for a mile in all directions. It was, to that time, the most lethal blast of a single weapon in history. Hundreds of men were killed instantly. The “Hell-burner of Antwerp,” as it was called, the first major bombing in Europe, was a chilling portent of gunpowder’s increasingly destructive potential. During this period of perpetual ferment, the man with the clearest vision of gunpowder’s deadly future was Gustavus Adolphus, the king of Sweden. Gustavus ruled a rustic kingdom barely touched by the sweeping changes of the Renaissance. Yet the young king had a vision and energy that would, for a time, make Sweden a power to be reckoned with. An affable man with golden hair and myopic blue eyes, Gustavus insisted on sharing the hardships of his troops on campaign, even helping dig earthworks when needed. He was a fighting king, a consummate man of action. Napoleon judged him among the half-dozen greatest commanders in history. Gustavus took the system sketched out by Maurice and brought it to fruition. He drilled his men incessantly and enforced iron discipline. He was determined to maximize their firepower. To that end, he issued lighter muskets and introduced paper cartridges, containers of premeasured powder that allowed soldiers to load faster. Faster loading meant more frequent volleys of fire. Gustavus, an expert gunner himself, introduced his most far-reaching changes in the realm of artillery. Until he took power in 1611, the big guns had been used primarily for siege work, for war at sea, and for the static defense of forts. The battlefield role envisioned by Edward III at Crécy had continued to elude commanders. The great guns, concentrated under the supervision of contracted gunners rather than soldiers, remained ponderous and largely immobile during the fighting. Gustavus integrated the guns more skillfully into his forces, creating the first effective field artillery. He assigned a handful of smaller, much lighter pieces to accompany infantry and cavalry regiments. If cartridges could ease loading for musketeers they could do the same for artillerymen—Gustavus ordered gunners to use prefilled bags of powder with balls already attached. Because of these changes artillery fire could be employed in the middle of a battle. The great guns, designed to smash stone walls but directed now against human flesh, added to warfare a new dimension of horror. By 1632, the war had already been raging up and down Germany for fourteen years. Gustavus found himself in command of a massive anti-Hapsburg coalition. He maneuvered a force of some 20,000 men into position to attack an army of similar size led by Albrecht Wallenstein, the mercenary commander of the imperialist force, outside the village of Lützen, fifteen miles west of Leipzig. Gustavus planned to attack at dawn, but the dank November morning brought a thick fog that stalled operations and gave Wallenstein time to recall a large detachment of cavalry. The battle that ensued in many ways typified the war as a whole. It was a story of firepower gone mad. The Swedes pushed forward into withering musket and artillery fire to capture imperial cannon, which they turned against the enemy at close range. But by doing so they lost touch with their own cavalry, allowing the imperialists to regain momentum. The thick mist descended again, mixing with the gunpowder smoke to blind the fighters and turn the field into a snarl of confusion. The effects of drill, rapid musket fire, and effective field artillery combined to inflict enormous casualties on both sides. Though he was the champion of a cool-headed, almost mechanical approach to military strategy, Gustavus could not keep himself from personally leading a detachment of cavalry to reinforce a weak spot in his line. He was hit by a bullet. His horse carried him away from his escorts into the wild melee. An imperialist cavalryman shot him in the back. He fell. Another enemy soldier fired a lead ball through his head. Looters stripped him to his shirt. His horse careered riderless through the chaos. The Swedish forces “won” the battle of Lützen, driving Wallenstein’s army from the field. Yet the awful carnage and the loss of their leader made the victory less than sweet. Wallenstein, broken by the battle, tried to sell out the Hapsburgs and was assassinated. Lacking a conclusion, the war continued for another sixteen years. Finally, Gustavus’s daughter Queen Christina joined Louis XIV of France as coguarantor of the 1648 Peace of Westphalia, which was to bring order, if not peace, to the European continent until the French Revolution. Gunpowder had, for the moment, turned military conflict into savagery. The ethos of the hunt had invaded warfare. Equipped with firearms, soldiers had turned predatory, chasing down beaten foes, killing prisoners, ravaging the countryside. Modern estimates put Germany’s losses during the Thirty Years War at almost 8 million persons, more than a third of its population. The conflict had imposed on an entire generation a level of atrocity and degradation that horrified thoughtful observers. Gunpowder, which philosophers had once imagined would protect Europe from a slide back to barbarism, threatened to plunge the continent into a new dark age.